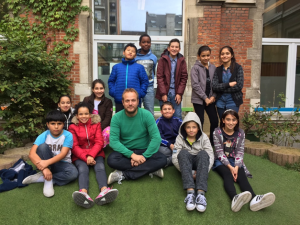 Olivier Dijkmans’ school is on the front lines when it comes to adapting to a diverse student body, including many refugees who have never attended school, and don’t know how to read, calculate or write. Olivier, a Microsoft Innovative Educator Expert, uses everything from green screens to Legos to engage his class that represents different lands of origin, different religions and different education levels. These days, Olivier is also excited about the Water Project, a global effort of nine schools on six continents to raise awareness around water issues and teach 21st century skills. Learn more about the project here. To connect with Olivier, visit his Educator Profile. What is the best advice you have ever received? Never forget the pleasure in everything you do. Favorite childhood memory: My first visit to Disneyland Paris. Favorite book: Koning van Katoren, Jan Terlouw. This entry was posted in Beyond the Classroom, Information, People, Personalized Learning, Project Based Learning, Student Voice. Bookmark the permalink.